With some great Spiderman party ideas you can throw your little superhero a birthday party that he won't soon forget! 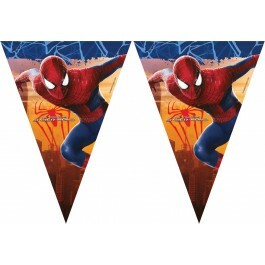 From great Spiderman birthday invitations to incredible Spiderman birthday decorations ideas, we have it all! So, if you are looking for Spiderman birthday party ideas in India here is your brief party-planning guide. 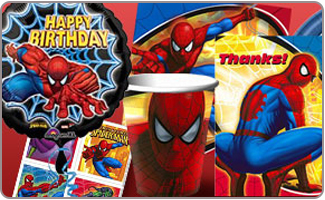 Order your Spiderman birthday party supplies several weeks in advance so that you'll have them on hand, on time. Ordering early will also give you plenty of time to order additional supplies if you find that you are in need of something else. If your home is not big enough for a large gathering then consider hosting it at a friend or family member's house. Alternatively, you could host the party at a park or at an area YMCA. A costume party is sure to be a lot of fun for all of the party guests so encourage them to dress up as their favorite superhero or super villain. If the party planning is proving to be overwhelming for you along with the demands of working full time and keeping up with your kid's activities, consider asking a close friend or family member for a bit of help. Even if someone else takes care of the games for you, it'll give you plenty of breathing room for the other aspects of planning the Superhero birthday party. Scan a favorite comic book strip, or find one online, to print onto card stock. Before printing, use photo editing software to create speech bubbles with the party details. Print a picture of Spiderman swinging between buildings, onto blank postcards. Use phrases like "Swing on by for a web-slinging good time!" on the front of the card, with the party details written on the rear of the card. On red or blue cardstock, draw the outline of a spider web. Carefully trace the spider web outside with a glue stick and add white thread and a bit of light-colored glitter to it, to give it the authentic spider web sheen. Consider a quick layer of mod podge over the web to keep it from getting damaged when mailed. Attach plastic toy spiders to invitations, for a fun spider touch! 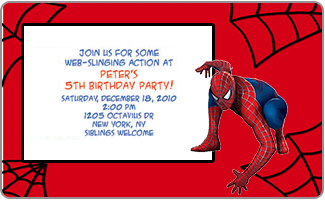 Browse our collection of Spiderman birthday party supplies where you can easily explore Spiderman birthday invitations and thank-you notes. These will save you some time and give a nice polished professional look to your party theme. 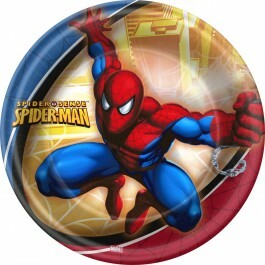 Spidey Spin is a fun game that will have you dividing the kids into small teams of perhaps three each. Each team must decide which one of them is to be the criminal being wrapped up in Spiderman's web. Arm each team with a roll of toilet paper or with a roll of white streamer and have them race to wrap up their criminal! The first team that successfully wraps up their bad guy will win the prize! Scatter plastic and plush spiders around the party area, using some of them as party decor but hiding a fair number of them. Explain to the party guests that research spiders have gotten loose and must be gathered before they do any damage. Set the kids loose to find and retrieve the spiders. Create a web in your living room or outdoors, using yarn attached to a small toy. Stretch each piece of yarn around furniture, under shrubs, over trees, and intertwining with other pieces until you've created a complex web of yarn! Attach a small card with each child's initials on it so that they can seek out their own section of the web and follow it until they find their prize. Peter Parker's Press Pass! Hand disposable cameras to all of the party guests, with the instructions that they must take photos of the party, just like Peter Parker would. Green Goblin tag is a fun spin on the traditional game of tag. 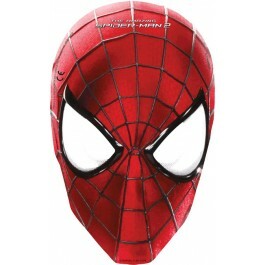 Draw out a square in the yard or at the park and select one person to be the Green Goblin. The object of the game is for the other players to run past the Green Goblin standing in the middle of the square, before he can tag them. If they are tagged, they then become Green Goblin helpers. The last Spiderman left then becomes the new Green Goblin. Pin the spider on the web is a fun twist on the traditional pin the tail games. A large spider web and a sticky spider are all you need to make this game a success! 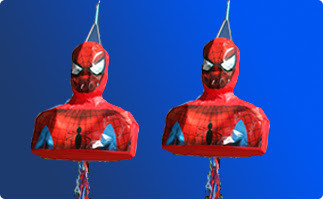 Piñata is a birthday favorite, hang a Spiderman pull string piñata filled with goodies and let the kids have gala time playing with it. 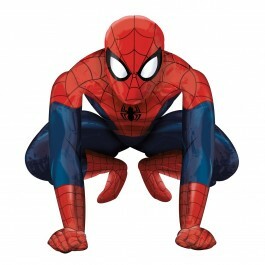 Spiderman coloring books, pencils, erasers, crayons, and paints can inspire creativity in your little superheroes. 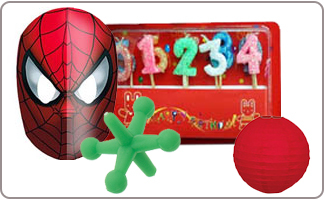 Spiderman themed return gifts like plastic spiders and webs, along with bouncing balls containing plastic spiders are all sure to be a hit. A few tasty treats like freshly baked cookies or some gummy spiders are always a popular choice. 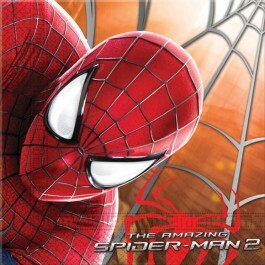 A DVD of one of the Spiderman movies is another choice, along with a Spiderman hood so that the superhero adventures can continue long after the party ends. Quench their thirst with Green Goblin punch, which can be assembled using green fruit punch. Freeze candy gummy spiders in blocks of ice to float in the punch. Carefully slice hotdogs three quarters of the way up so that you have eight evenly sliced "legs." Boil the hotdogs in water and watch the legs curl up to form an octopus, making Doc Oct's hotdogs for everyone to enjoy! 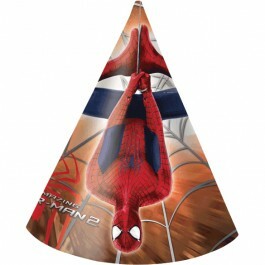 Some Spiderman party ideas for the cake include decorating a sheet cake with a selection of Spiderman cake toppers. A Spiderman-shaped cake is another great choice, as are red and blue cake pops and cupcakes decorated to resemble a web, or Spiderman's mask. Keep your superheroes energized with a selection of sports drinks and sports nutrition bars that will pack the power punch they need to fight crime! Personal sized pizzas or burgers will satisfy the hunger of your active superheroes, consider allowing them to pick their own toppings for their pizzas so that everyone is content with their pizza! You can also add a theme touch to the pizzas by giving it a spiral topping. Other Spiderman birthday party ideas and must-haves include crackers, gummy spiders, fruit skewers, deli meats and cheeses. 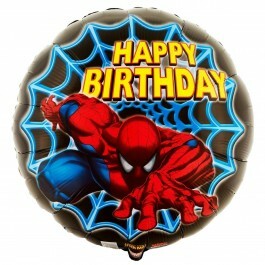 Use red, blue, yellow, black, and green balloons to decorate the Superhero birthday party. A good mixture of Mylar and latex balloons will give the party a nice festive flair. 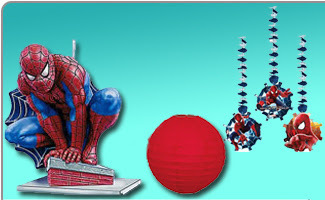 Place a Spiderman Airwalker at the party entrance for giving lil super heroes an action-filled welcome. Have your local copy shop print out several images of Spiderman and some of the Spiderman characters. These can be taped to your fence, doors, and used to decorate the walls in the party space. Visit a Halloween party supply store for some cotton to make spider webs. 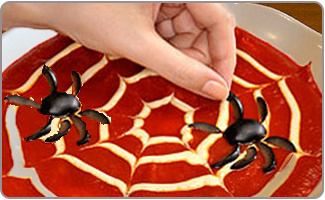 Make large webs around the house, using plastic spiders to decorate the webs. Cover the birthday table with a Spiderman themed tablecloth, or consider using a plain red or blue tablecloth if you are looking to make the other Spiderman birthday party supplies the focal point of the party space. 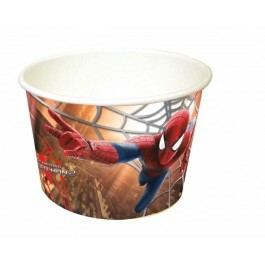 Some other Spiderman party ideas for the party table include a good selection of Spiderman birthday decorations like Spiderman plates, cups, straws, napkins, and return gifts like blow outs and party hats. 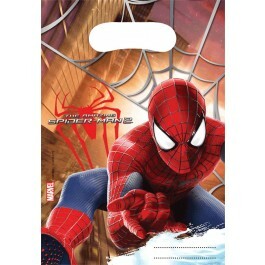 Use fishing line or white yarn to suspect plush and plastic spiders from the ceiling for that authentic Spiderman feel!